Just before the actual build, you'll need to mark the location of the playspace perimeter and all the equipment post holes. This requires a skilled volunteer or professional installer. It's up to you to choose the exact location and orientation of the equipment, but you can ask your installer for advice. Make sure that you orient the "transfer station" (low steps or a platform where children with disabilities can pull themselves onto the structure) toward a wheelchair-accessible entrance to the play area. You've probably already discussed how you're going to accomplish this. 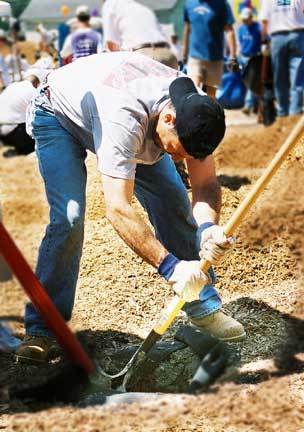 If you're using heavy machinery, limit the number of volunteers present to ten. Note: If you're removing old play equipment from the site, make sure that you remove any concrete "footers" before you dig! After digging is complete, most installers will use a transit to make sure that all of the holes are level and of equal depth. We also recommend placing a round patio stone at the bottom of each hole to stabilize the post. When your equipment arrives, it will be a jumble of parts with strange numbers and bar-code markings. Set up a system for checking each piece against the sales order to ensure that all of your equipment has arrived intact. It's also a good idea to sort and mark all the pieces according to their destination (activity panel, peak roof, arch bridge, etc. ); this will eliminate confusion and allow volunteers to get right to work. This is particularly important if you are planning a one or two-day build with large numbers of volunteers. These are the real nuts and bolts (and connectors and clamps) of the playspace! You will receive hundreds and hundreds of pieces, each with a special place on the playspace. If you don't sort them ahead of time, you'll witness COMPLETE CHAOS as build captains and volunteers try to find the pieces they need. Our solution is this: Get the specifications book from your play equipment company. Label a separate bucket for each major play component (e.g. "spiral slide," "transfer station," "crawl tube," etc.). Using the specs book, count out all the hardware necessary for each component and throw it into the bucket. Whenever possible, leave hardware inside its plastic bags; this will reduce the chances of a mix-up. When a component has a large amount of hardware, it can also be helpful to the volunteers to separate out the different pieces into smaller plastic bags, taking care to label the bag with the name of the piece it contains. Some play equipment companies offer pre-sorted hardware, so be sure to talk to your representative or installer about how the hardware will be shipped. If you haven't labeled donated tools with the names of their owners, be sure to do so before the build. You should also set up a system for checking tools in and out, and tracking them throughout the day... it's easy for tools to walk away! Have test holes been dug at the site? Does your team foresee any problems with underground utilities? Have soil samples come back from the lab? What were the results? Has your team had any success getting tools and materials donated? What do you still need? How is your approach working? Have you brainstormed new potential donors? Has your team secured the necessary machinery for major site prep? Do you have an operator? Has the work been scheduled? When is it? When assigning the components to teams, make sure to examine the amount of hours the manufacturer estimates that the pieces will take to put together. This way, you can ensure that each team will complete its tasks at roughly the same time. This team will assemble, install and level the main decks of the playspace. This is the skeleton of the structure, so it's important to get it right; if you are hiring a professional installer, he or she will probably lead this team. Limit participation to no more than 12 volunteers at a time. Depending on the size of your playspace, you'll need two to five teams to assemble and attach the playspace components - e.g. slides, tubes, climbers and anything else attached to the main structure. In one day, a team of eight to ten volunteers can usually assemble and attach components for up to three decks. (So if your main structure has six decks, you'll need two teams of volunteers or two days to do it.) Limit participation on each team to no more than 12 volunteers at a time. These volunteers will assemble components not attached to the main structure: swings, bounce buttons, rock walls, drums, rockers, see-saws, etc. Again, one team should be able to assemble and install three components per day. Limit participation to no more than 12 volunteers at a time. If you are installing loose-fill surfacing (mulch, sand, rubber mulch, etc. ), you'll need a large team to transfer it onto the playspace by hand (e.g. using tarps, wheelbarrows or buckets). This is the most labor-intensive and time-consuming build task, so assign as many volunteers as possible and get started early. As long as they don't interfere with the post holes or installation process, volunteers can and should be moving surfacing throughout the day. "Playspace border" refers to the containment system for loose-fill surfacing, typically a plastic or wooden barrier that is anchored by metal stakes. Concrete is used to secure the playspace posts. We've grouped these tasks together because they're both relatively short and because borders should be installed first thing in the morning, while concrete mixing needs to wait until the playspace decks and components are ready to be installed. One team can be busy with both these tasks throughout the day. Limit participation to 12 volunteers at a time. You'll need a separate team of volunteers for each side project (landscaping, benches, murals, gardens, etc.). Because these projects are often creative and open-ended, there's no limit to how many people can participate. For safety's sake, we recommend taking care of any cutting and sawing operations in advance, before dozens of volunteers and their children show up! If this is impractical, make sure to designate a separate, marked-off area where cutting and/or power tools will be used. Once you divide the build into manageable tasks, you'll need to decide which jobs require specialized skills. If someone with construction experience were to show up, where would you put them? Do you want unskilled volunteers leveling decks or fastening hardware? This is also a personal safety issue; unskilled volunteers shouldn't be handling power tools or doing heavy lifting. Work with your safety and recruitment captains to create a system of labeling volunteers' name tags with an appropriate skill level, and make sure the people signing in and assigning volunteers are in the loop. Another option is to pre-assign volunteers; not only does this give you more control, it also helps volunteers build team spirit and prepare for the day. Ask them to collect pledges as a team! It's also important to decide which safety accessories are required, and for how many people. Draw up a list and discuss it with your safety captain; he or she can be responsible for soliciting or purchasing the items. Remember that it's better to have too many. Safety goggles, back braces, hard hats, work gloves, dust masks, plywood to cover holes, ear plugs, fire extinguisher. If your build goes as planned, there will be dozens of volunteers working simultaneously and you can't supervise them all! You'll need a volunteer leader or "build captain" to oversee each of the projects outlined above. As you begin brainstorming potential candidates, remember the most important quality for a captain to have is leadership, not construction experience. They can be trained in the construction skills they need. The build will run more smoothly when the volunteers are well-managed. Captains should become familiar with their tasks and remain with their teams throughout the build. Volunteers have a more rewarding Build Day experience when they work together, and when they feel that they're genuinely contributing. Build captains should encourage people to pool their efforts, and keep their eyes open for signs that one person is dominating the work and the team. Volunteers need guidance and assurance, especially when assembling unfamiliar equipment. The build captain is the person they should turn to with any construction questions. Instruct your build captains to first check the installation instructions themselves - and to try to use their own good judgment! For questions they can't answer, they should come to you or the professional playspace installer. Build captains should be responsible for distributing tools among their team members and for the tools’ safe return at the end of the day. Make sure captains can identify all the tools they'll need. If you're concerned about security, you might establish a system whereby build captains are the only people "authorized" to approach the tool storage area. Educate your build captains on possible safety hazards - the more eyes, the better! Common safety hazards include improper use of machinery and tools, tools lying around, volunteers not taking rest/water breaks, improper installation, and children on the construction site. You will be leading one of several component teams. Your team will be given one to four components to assemble and you'll be provided with a bucket of hardware, installation instructions and a list of tools needed for each component. Your construction team captain will help you decide how many volunteers you should assign to each of the components. Encourage the team members to READ the directions. People will be eager to jump in and start the assembly, so put the brakes on and review the entire process step by step. We won't include tamper-resistant bolts in the buckets. The installer and construction captain will be responsible for these, because once they go in, they're really hard to get out. Some of the components can be tough...be patient, and carefully read and follow the directions. There will be some extra hardware and tools in a central location; if you need something you don't have, you might find it there. Attach all of the parts to the component. This will make it easier to transport, even if they'll have to partly disassemble the component to attach it to the main structure. Just loosely attach the pieces that may come off. All other pieces should be tight and secure. Keep your team working together - make sure everyone has a chance to contribute! Follow the lead of the Construction Team captain and the installer about when to attach your components. When carrying big components over, remind people to watch out for holes! Have someone go in advance to clear people out of the way. Keep your folks taking breaks, especially if they are working too quickly. Keep in communication with the Construction Team captain. When the building process is stalled, keep your team working. Look around for other teams that need help. Could the surfacing team use extra people? Did you clean up any plastic or cardboard from your components? Have you collected and turned in all your tools? Or just take a break together! Your team will be responsible for mixing the concrete that will hold the playground in place. This is a critical job and one that really gets going toward the second half of your day. You'll be mixing the concrete in wheelbarrows, and pouring it into holes where posts have been set. Timing is important, because the concrete needs to be ready as soon as (but not until!) the playground is level and ready to be made permanent. You will be cued by the installer or construction team captain at the right time. Remind everyone that the concrete will take 72 hours to set before the kids can play on it. Keep a close eye on the action. If you aren't being cued, check in with the construction team captain. Ensure that the concrete you are mixing is the right consistency, not too runny, not too thick and thoroughly mixed throughout (with no dry powder). You might want to have one person responsible for controlling the water and making sure that the concrete is mixed to the correct consistency...the concrete quality control volunteer! This is a hard, back-breaking job. Keep your volunteers switching up and taking breaks. Assign someone to be "chief bag counter." They should count concrete bags regularly and let you know how many are left. When you get down to 20 bags, let the construction team captain know. Make a list of everything that needs concrete — there may be more than just the playground! Is there a sign being installed? Are trash cans or benches being built and installed? Pace your team for the different assignments. Dust masks will help prevent people from inhaling cement particles; encourage your team to use them. If the site has had rain, water may have partially filled the holes for the playground posts. Communicate with the installer and Construction Team captain about how much water to add to the concrete; they may need a drier mix to accommodate these conditions. You have a huge job ahead of you! Just take a look at the surfacing pile — it all has to be transported to the playspace and spread beneath the equipment, one load at a time. Your job is a dirty job, but your team will have a great sense of satisfaction when you are through. Shock-absorbent surfacing is a crucial part of playground safety — without it, children's falls can be life-threatening. The majority of playground injuries today occur due to improper surfacing. We are using an engineered wood fiber, which is mulch that has been processed twice to make it softer, more durable and smoother for wheelchairs. It is also fire-resistant. Safety testing has shown that nine to 12 inches of mulch will break a fall from as high as nine feet, and will do so as effectively as other types of surfacing. In addition to moving the actual surfacing, your team will secure a bottom layer of felt first; this helps improve drainage. Another team of volunteers will install a foot-high border to hold the surfacing around the playground. The borders of the playspace will be laid out and marked during pre-build site preparation. Your first job is to lay felt. You'll need to roll out the felt and cut it around the holes. Have your team use tarps for the mulch. 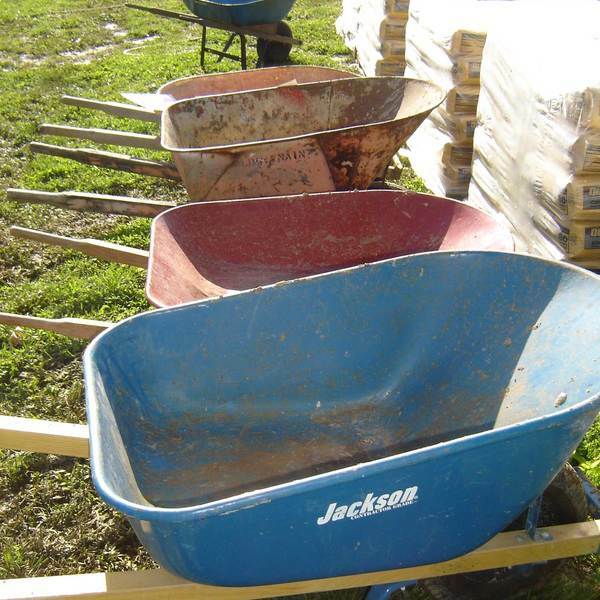 Save the wheelbarrows for the concrete crew. Use teamwork. Station a few people on the mulch pile; they'll shovel smaller piles onto tarps. Teams of two to four people can then transport the tarps to the playspace. Moving mulch is back-breaking, but if people work together as a team, it is much easier...spread the work out and it will be more fun! The construction team captain and the installer will tell you where to put mulch in the early part of the day. Remind people to watch out for holes! Dust masks help prevent people from inhaling mulch particles; encourage your team to use them. When the building process is stalled, keep your team busy loading tarps. If you've done that already, scout around for other work to keep your folks engaged. Or just take a break together! 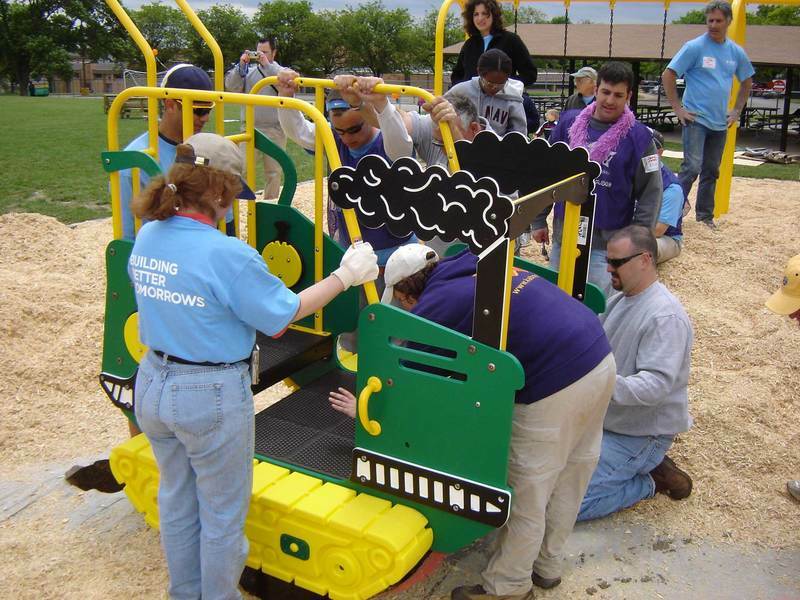 Installers are experts on play equipment, but they are not necessarily experts on managing large numbers of volunteers. Help your co-chair(s) explain the role that you and your build captains will play during the build. If your installer is supervising site preparation, confirm the scheduled dates and times. Make sure that he or she plans to bring any specialized or playspace-specific tools, including a transit if they are digging the holes for the playground posts. On the day of the build, your installer should be a "hands-on" worker. 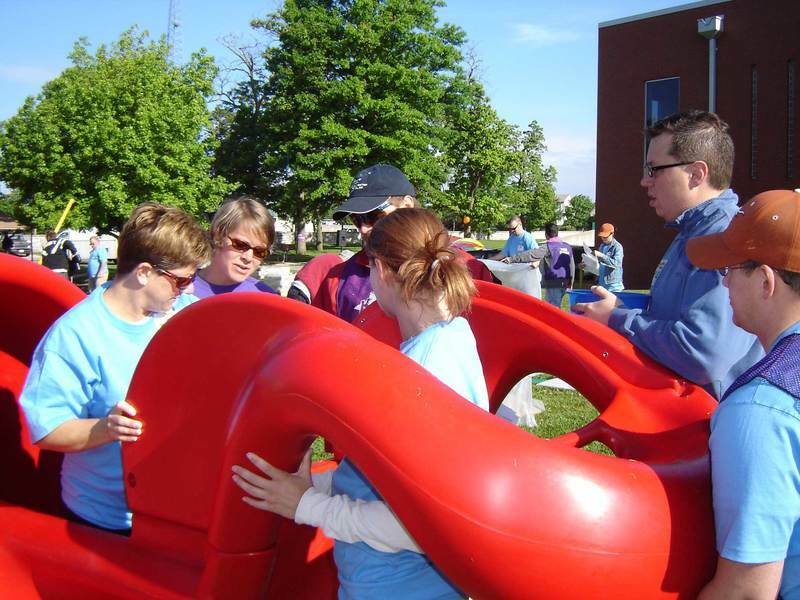 It is the installer's job to direct volunteers toward specific tasks, instruct volunteers on how to assemble various pieces of play equipment, and make sure that all playspace safety guidelines and requirements are met. The installer is there not only to install the equipment, but also to answer any questions that arise during the installation process. 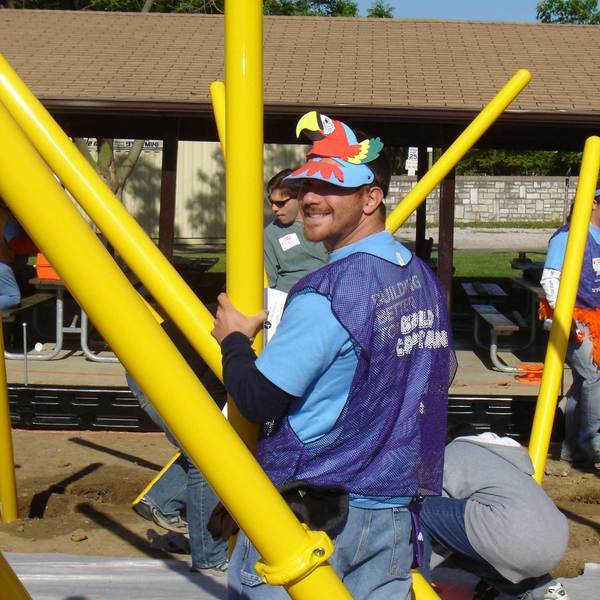 They can also work with you to determine which components of the playground should be completed first by the teams to ensure that the structure comes together smoothly throughout the day, with the pieces that will stabilize the decks and posts being attached early. Once construction is complete, the installer should inspect the structure to make sure that everything is in proper working order. You should request a signed letter or certificate in which the installer "signs off" on the job; in addition to giving you peace of mind, this is important for insurance and liability purposes. Depending on the terms of your agreement, the installer might also meet with your maintenance crew after the build to teach them how to maintain the new equipment.